A unique, functional variation of the traditional glass wine thief. We ordered these from eastern europe where the pricing/quality is great. The design was supposed to look exactly like our traditional thiefs we have made locally in Berkeley, California. Thus we used a picture of the original thief in our latest catalog. But alas, when they arrived they looked unlike any wine thief we have seen. But.... they work fantastic so we are happy and we think you will be too! Upon further testing and working with this thief, it has become clear that it can be tempermental about which carboys it fits in. If you'd like a glass thief for a carboy, we have to recommend the MT345. This still works great for barrels, even stacked ones! 1" in diameter, 10" from the bend to the tip and about 14" total length. It’s a little smaller that I would like but good quality. Enjoy using this wine thief. You can easily see how much wine you're drawing up, and works better than the cheaper plastic models. Significantly less expensive than steel wine thieves. Looks cool when you're drawing wine up for friends. Easily sanitizable with StarSan (I keep a bucket in the winery for such things). The inside stains a little over time after drawing up red wine frequently, even with rigorous rinsing after use, but I don't think this is a sanitation problem. Happy with this purchase. The wine thief leaks just a bit when holding wine but otherwise draws wine well. Wish that Morewine would offer a Stainless Steel thief. We go through a lot of these. Look good, but in a winery these are always breaking. 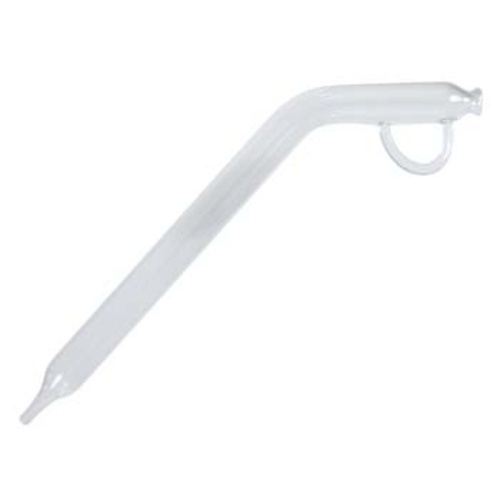 We do offer a stainless steel "turkey baster" style wine thief - MT344 - which comes with a food grade rubber squeeze ball for easy sample collection. We looking for a few barrel thiefs for our winery and liked the price so I tried one. The handle is very small and makes it awkward to work with.